Our challenge this week at Make My Monday is Flowers. I decided not to worry about matching up. 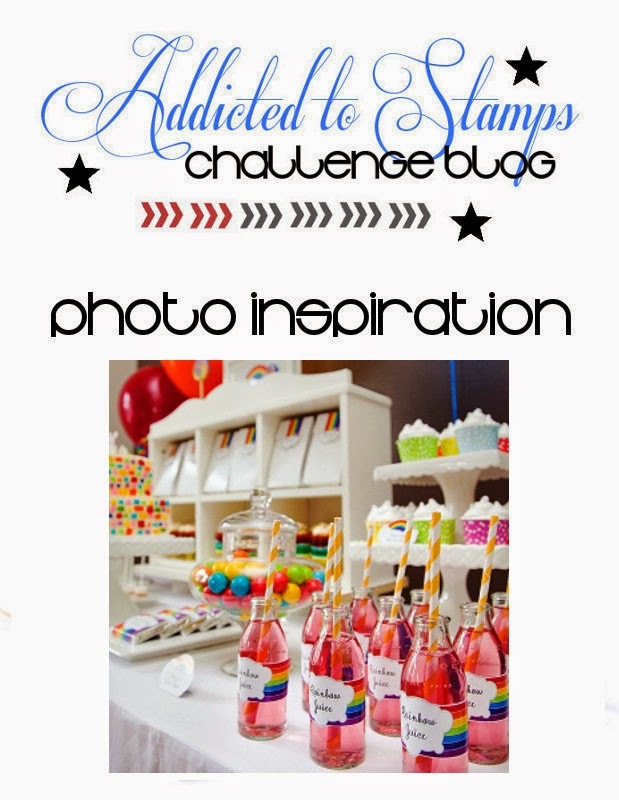 I made the background by using just one stamp randomly stamped with distress ink. Then I did the 'two-step' thing with two colours of Distress ink, not worrying too much whether they matched and then cutting them out and sticking them on with 3d foam. 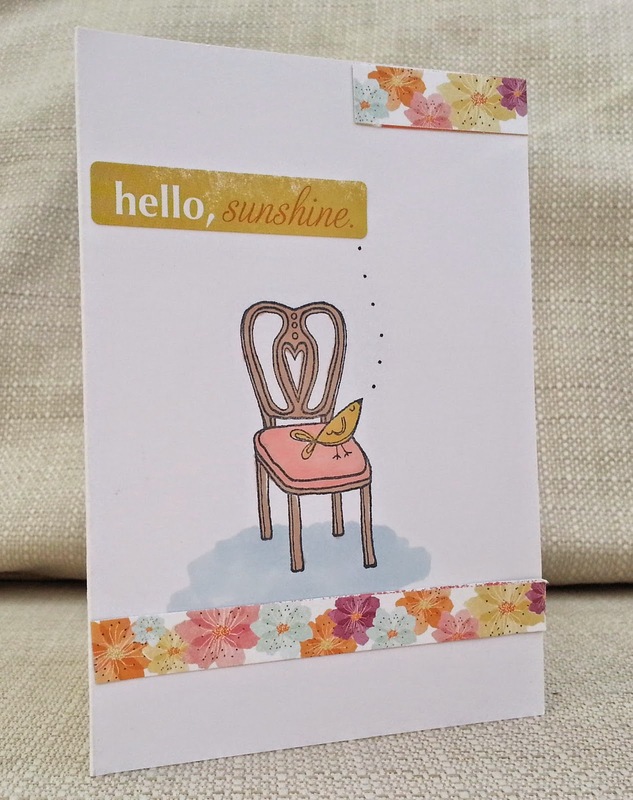 The 'hello' is from a different Stampin Up set. We'd love you to join us at Make My Monday. This bird on a chair stamp is by Unity - it originally had a thought bubble with words attached to it but as I didn't want to use that , I cut it off. I coloured the image in with Promarkers and added a sentiment sticker and strips of floral card, to give it a spring feel. 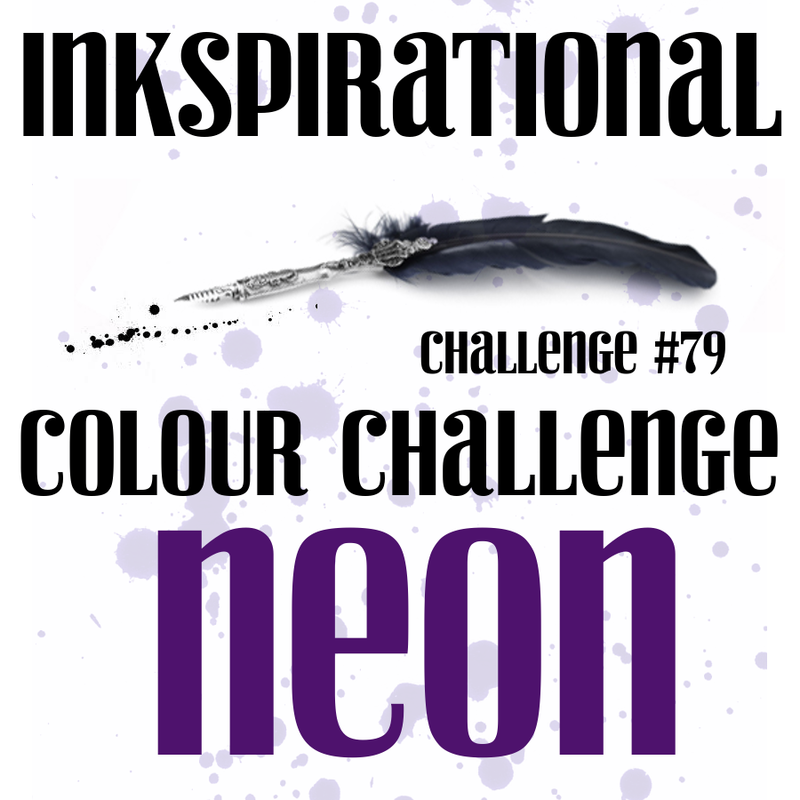 Our new challenge at Inkspirational is to use neon colours. It was my team-mate Sandie who first suggested this challenge and to be honest, at first, I was secretly a bit scared! Then I got these flourescent stickers free with a magazine. I stuck them onto punched out black circles and they reminded me of old vinyl records, so I stamped some music in the corners. I hope you will join us at Inkspirational , visit our Guest Designer Michele, and the DT, and enter your own neon project. 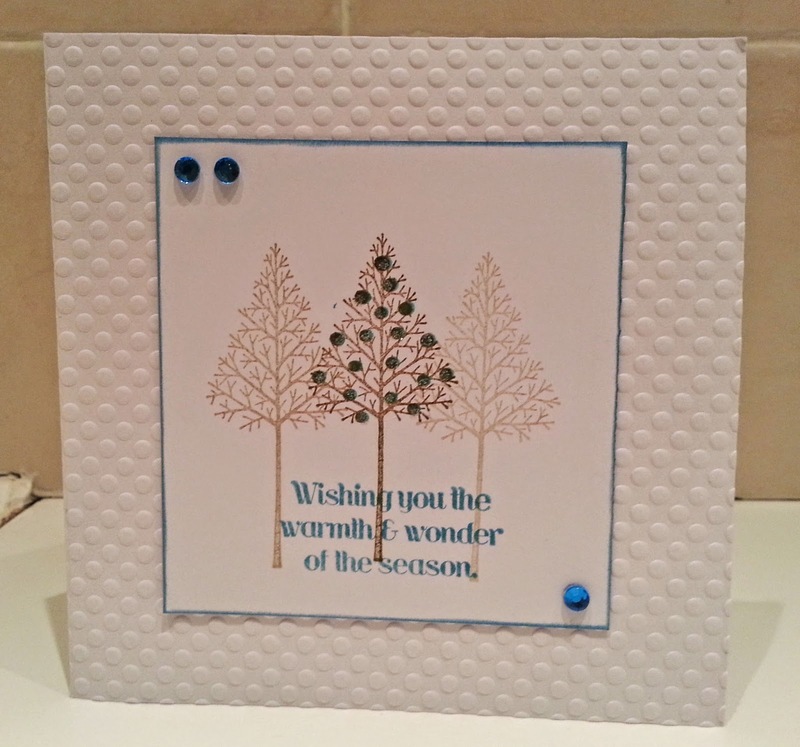 Here's a Christmas card made from a previously unused set - Warmth and Wonder by Stampin Up. What, this old stamp? It's vintage Darling! Here's a couple of oldies but goodies - the woman is a wood mounted stamp but has no branding on it- I think I got it from Oyster Stamps. The circular sentiment is by My Sentiments Exactly . The paper was a magazine freebie. This week's theme at Creative Cutting Challenge is Easter. 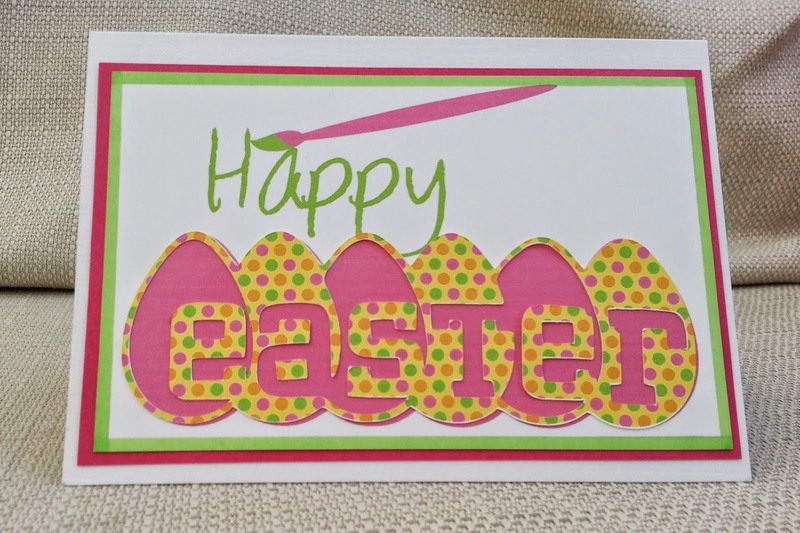 I used ' Easter Headings ' cutting files from our sponsor , The Creative Pointe . If you have an electronic cutting machine, use an SVG to make an Easter project and join us at Creative Cutting Challenge. 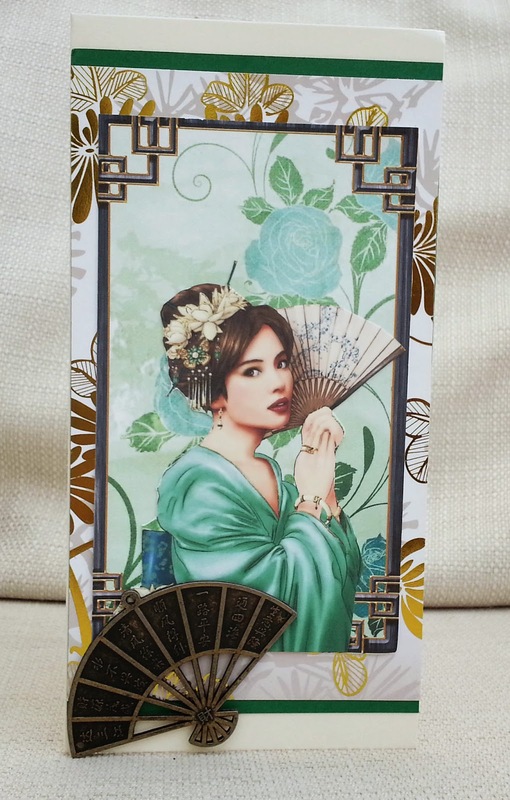 I used an oriental image from a Debbi Moore CD, some foiled background paper, green cardstock and a big fan embellishment. Simple, I know, but hopefully useful for a 'no occasion' card when needed. I hope you will show us your green projects at Make My Monday. I went to my local 'crop' yesterday and, at last, finished the layout I'd started at the previous month's crop! The patterned paper is, I think, a leftover from a crop kit we had years ago. I traced and cut the silhouette on my electronic diecutter and the words are a Sarah Hurley stamp. 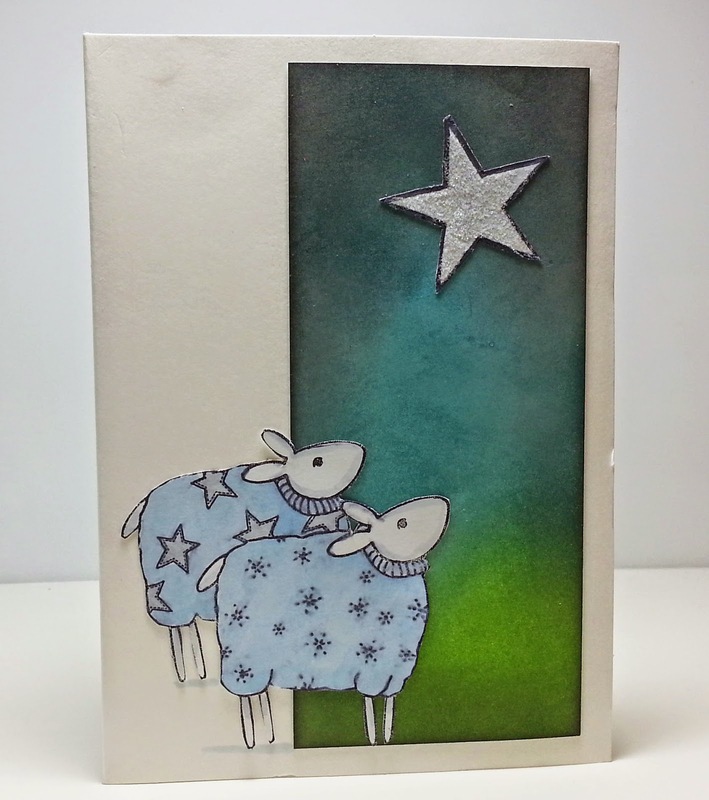 I made a Christmas card using these sheep from InkyDoodles, a star stamp, glitter (on the star), markers and ink. For some reason I'm always drawn to pictures of animals in woolly jumpers. Weird! Happy Birthday to my lovely Inkspirational teamie , Kim . Seeing her card here will certainly not spoil the surprise as she received it about a week ago and I had forgotten to put a 'do not open until..' on the envelope! A few weeks ago I overspent at a stamp show in Stevenage. 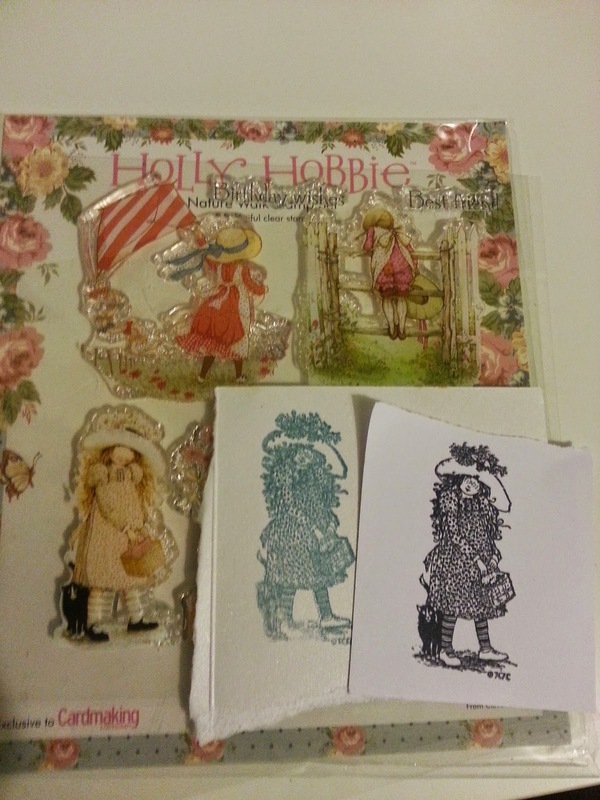 This card uses stamps from four sets that I got then - 2 Paper Artsy sets, Inky Doodles and Stamp Addicts. I also used a green Promarker and coloured it in a scribbly way to keep with the sketchy look of the stamps. Anyway Kim, I hope you have a great day! 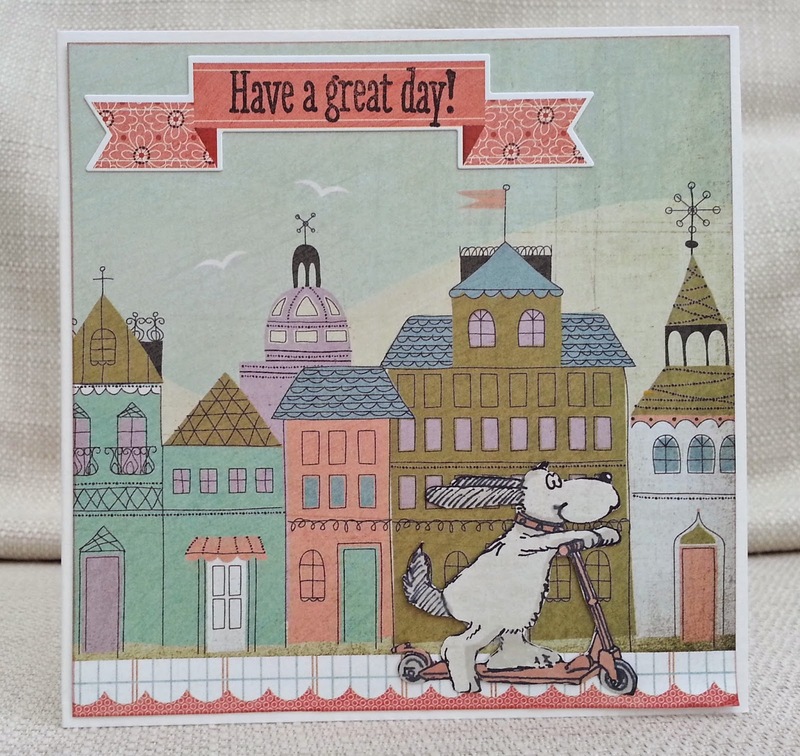 Our theme, this week, at Make My Monday , is to make a scenic card. 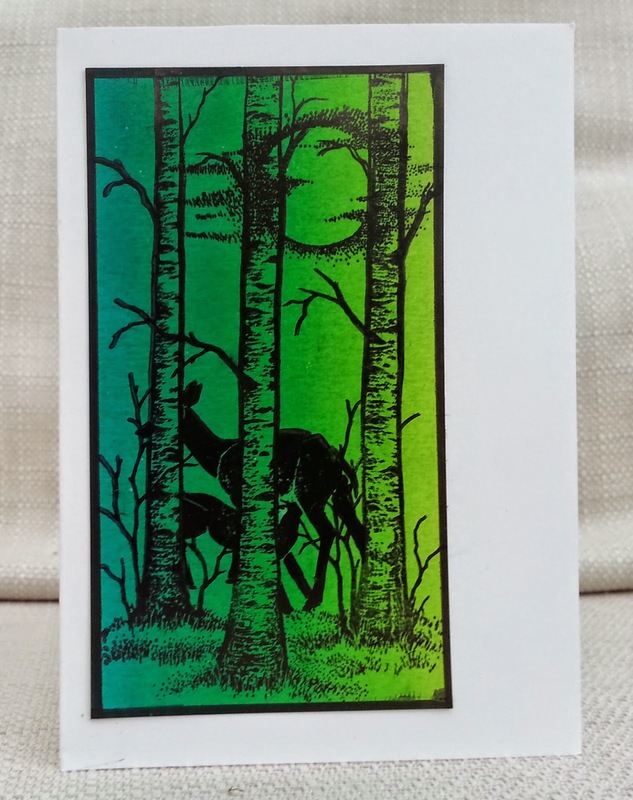 For mine I used three stamps , a variegated green inkpad and a brayer. I couldn't think of how to embellish it,so I just kept it plain. I quite like to have cards without sentiments to just write a quick note or whatever. 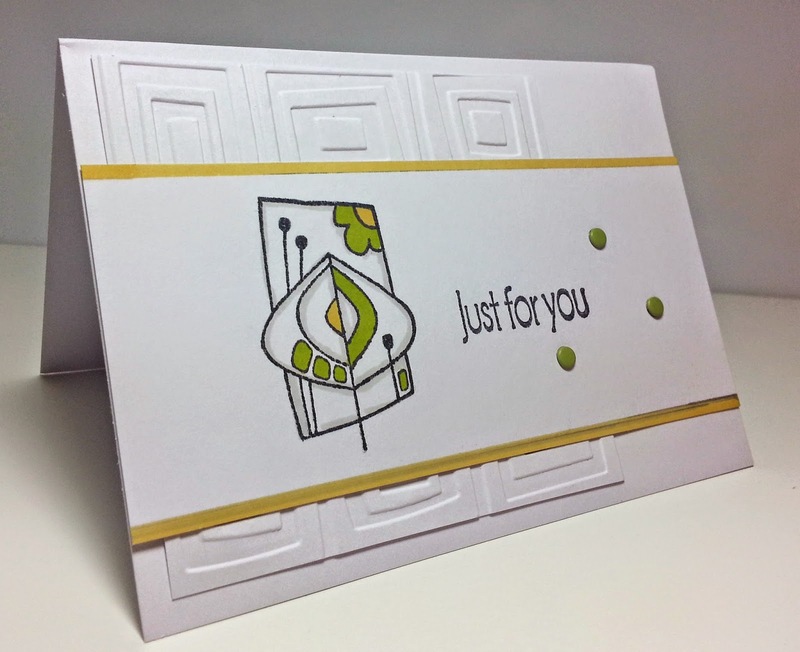 We'd love you to make a scenic card and join us at Make My Monday. 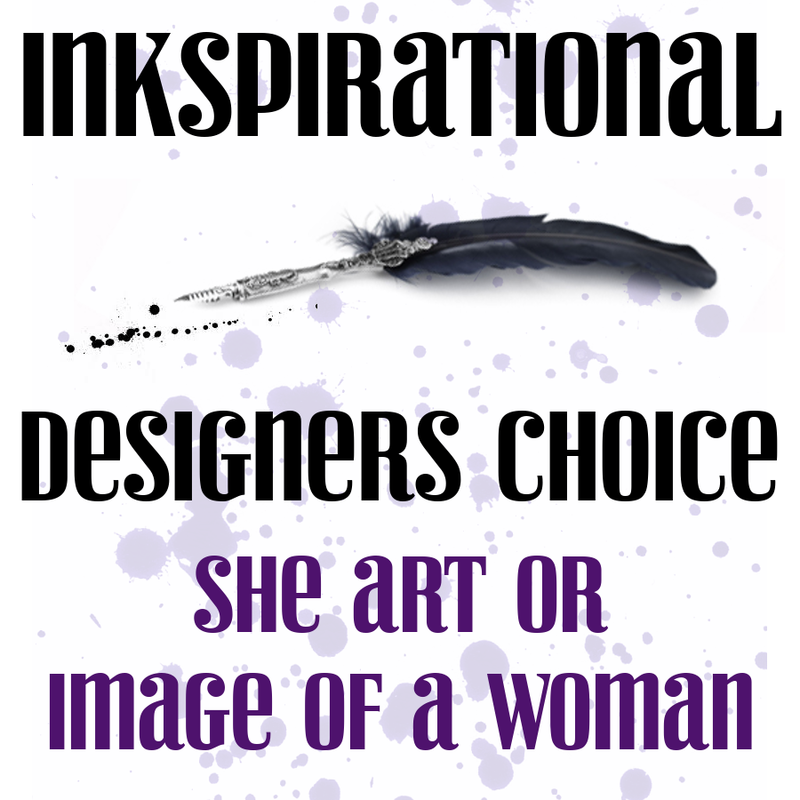 Our new challenge a Inkspirational is 'She Art or Image of a Woman'. I wanted to get the flavour of the She Art style , but with my own twist. First I painted, stencilled and sprayed a canvas. Then I printed a large image from A Day For Daisies onto sticky backed canvas. I cut the image out and then cut the hair from the face - I painted the face and neck and then did the hair with paint, stamps and ink. The quote was cut out on the Silhouette and using a label maker. Do you recognise the quote? 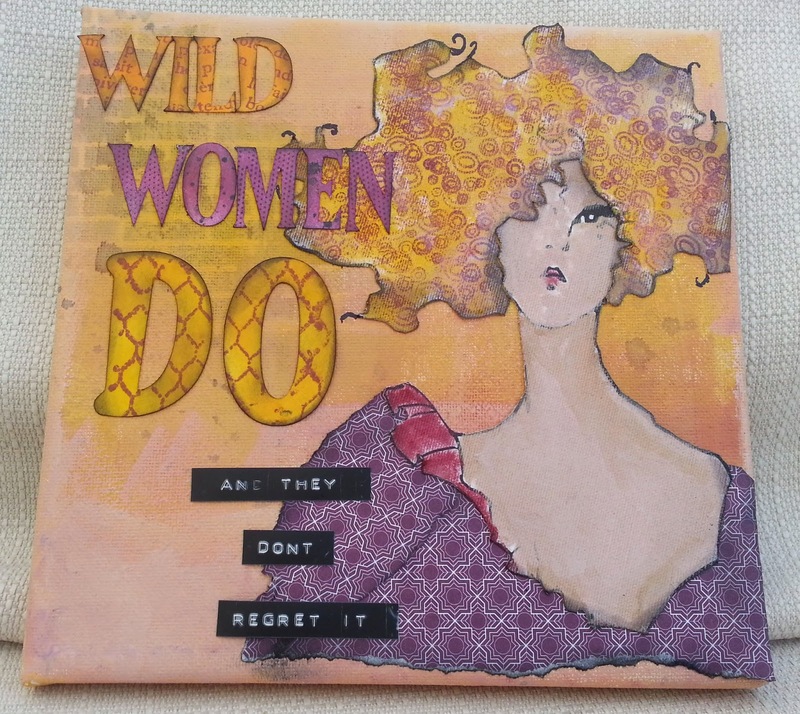 It's a lyric from a Natalie Cole song, and the next line is 'what you only dream about, wild women do.' I can feel a sequel canvas coming on! Please come and visit us at Inkspirational and see all the different ways the DT, and our GDT Lyndal have interpreted the theme. Paper Artsy deconstruction - I deconstructed that digi and reconstructed it again. I recently smartened up my craft room and got a new desk which has a magnetic board to pin up bits of paper...so I made some magnets to go on it. I was inspired by the photo at Addicted to Stamps to use a set of 'sweet treat' themed stamps, an old magazine freebie, from my 'empty box project' box. One of my problems with magazine freebie stamps is they are often (I feel) too small to make an impact - but here, I turned the smallness to my advantage. 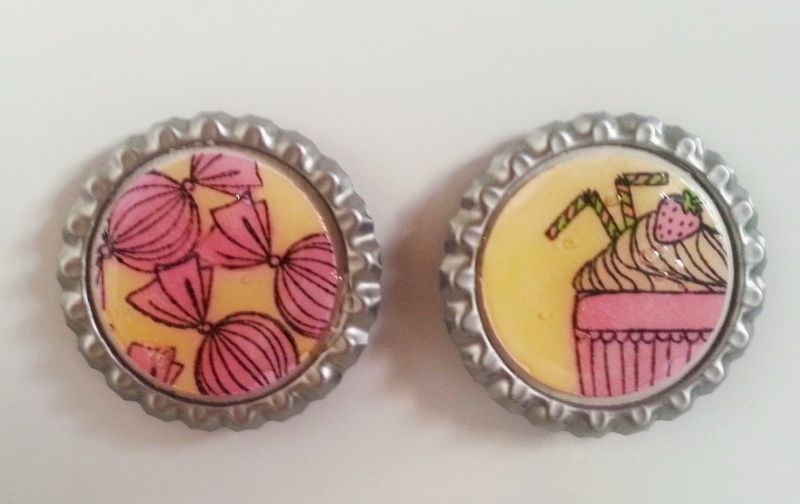 I stamped and coloured the images and punched a circle from them, which I stuck to a flattened bottle cap. Then I covered the whole thing with 'glossy accents' and attached a magnet to the back. It's Mother's Day on Sunday (UK) and I made this for my partner to give to his mum. 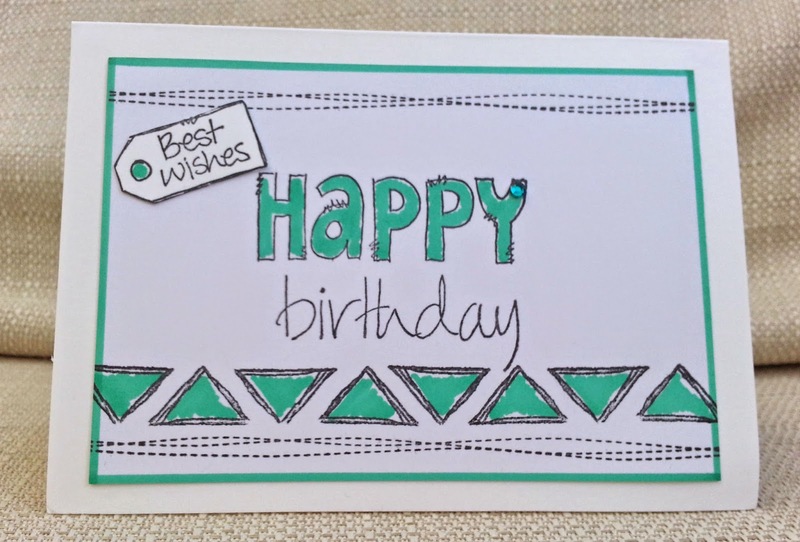 I used Stampin Up papers and an SVG box card file. 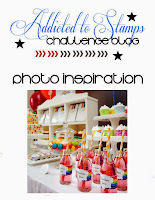 I also used a label stamp, punch and sentiment stamp from Stampin' Up (and no, I am not a demonstrator!) plus various embellishments - buttons, brads, liquid pearls. Allsorts spring is in the air. 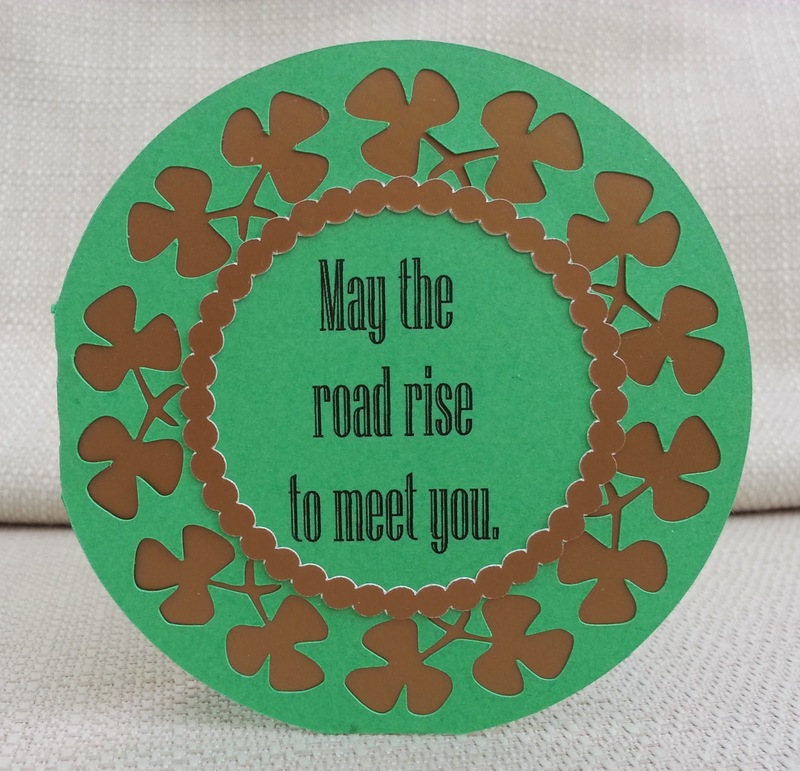 This week's theme at Creative Cutting Challenge is St. Patrick's Day. I've never heard of anyone in England sending a St Patrick's Day card - I think it's bigger in the US- I do know some people who go to Irish pubs on St. Patrick's Day though! 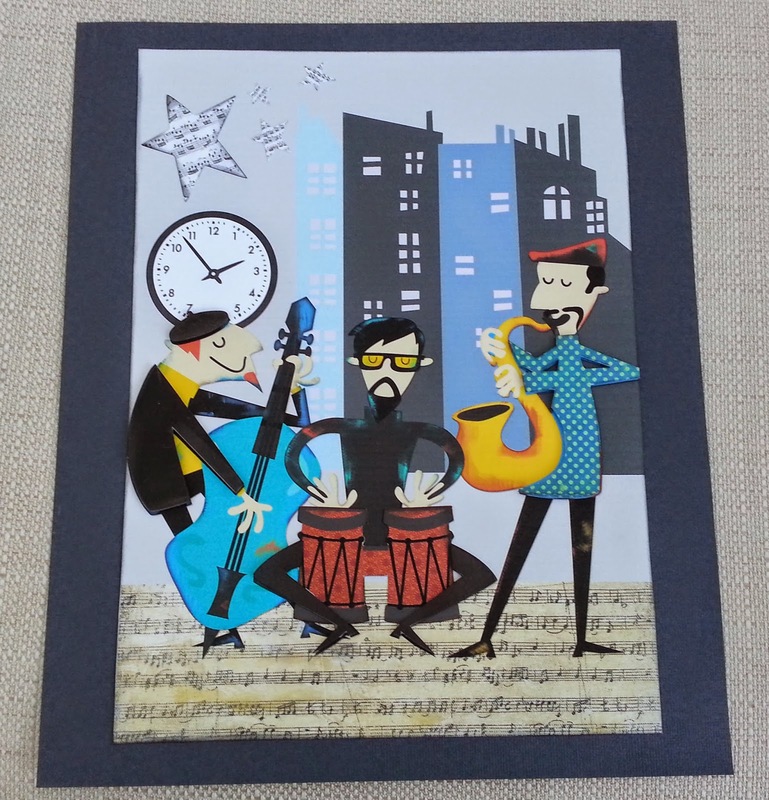 For my card I used a cutting file by The Creative Pointe . The sentiment in the centre is from 'Irish Blessing' although I know it better from a Public Image Limited song (that's Johnny Rotten's band). If you have an electronic cutting machine, use an SVG to make a S.Patrick's project and join us at Creative Cutting Challenge. It was my turn to choose the theme at Make My Monday this week and I chose - building, town or city. I had loads of ideas - new home card, 3d village (ambitious!) 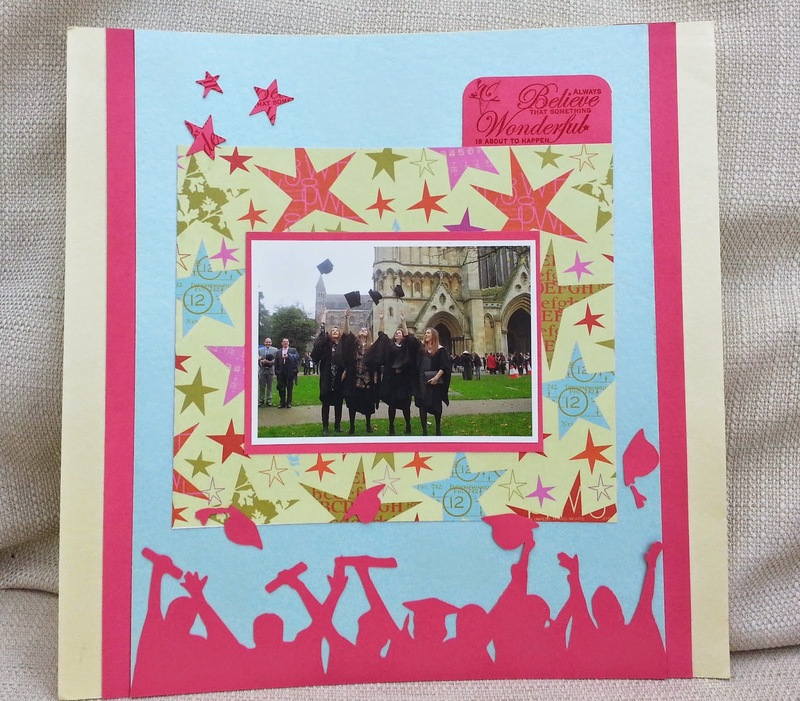 , London or Paris themed card...but in the end I went with this (above). I used a scrap of Basic Grey What's Up 12x12 paper that had the buildings on it. The banner is a sticker from the BG paper pack and I stamped the sentiment inside it. The dog on the scooter is a Penny Black stamp that I coloured in and cut out. I hope you will join in the challenge at Make My Monday. Empty Box Project #10 and two that didn't make it. When I stamped this leaf from a 'free-with-magazine' set from my 'empy box project' box, it really reminded me of designs on the crockery we had in my 70's childhood - and I don't suppose it was very fashionable even then. I coloured the leaf in with slightly muddy shades of yellow and green - I'll call them avocado and mustard to keep with the retro theme! 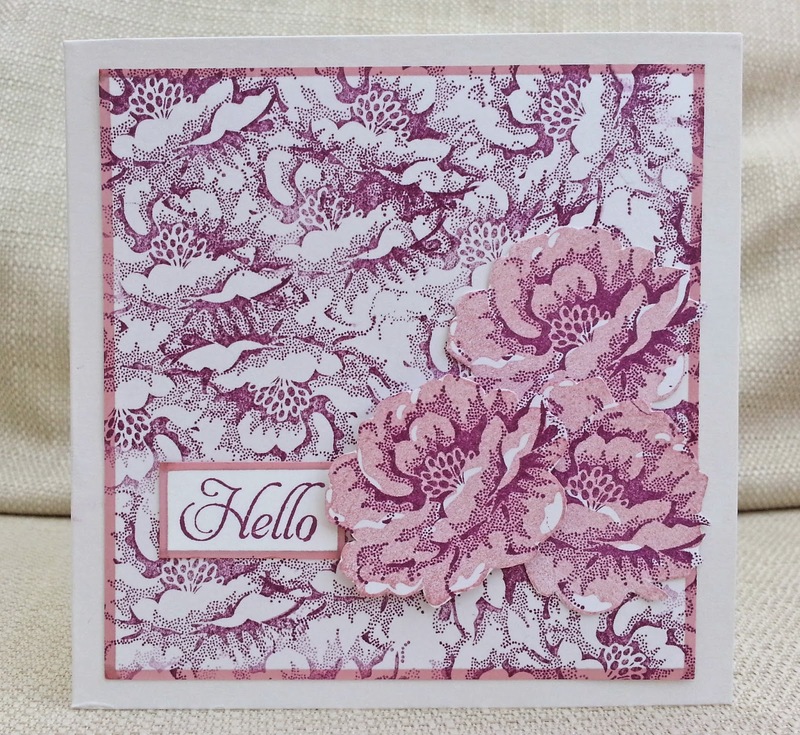 The sentiment was from another set and I embossed a piece of card for the background in a retro pattern. Sadly, I had a few items that didn't make it to the final cut,..both magazine freebies. The stamps on this one had stuck so hard that I ripped one trying to take it off the acetate packaging- they were binned. They look lovely on the packaging, but quite muddy when stamped, so I just couldn't see what I could do with them. If anyone (UK only for postage costs) wants to give them a good home, please leave me a comment. Otherwise I'll keep the sentiments and bin the rest. Time Out Challenges photo. 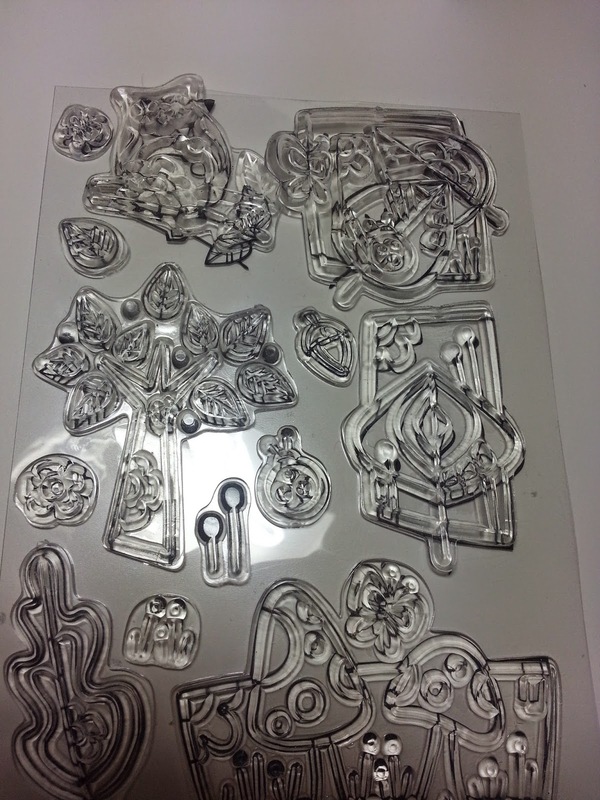 Influenced by the frames for the embossing and round the leaf. 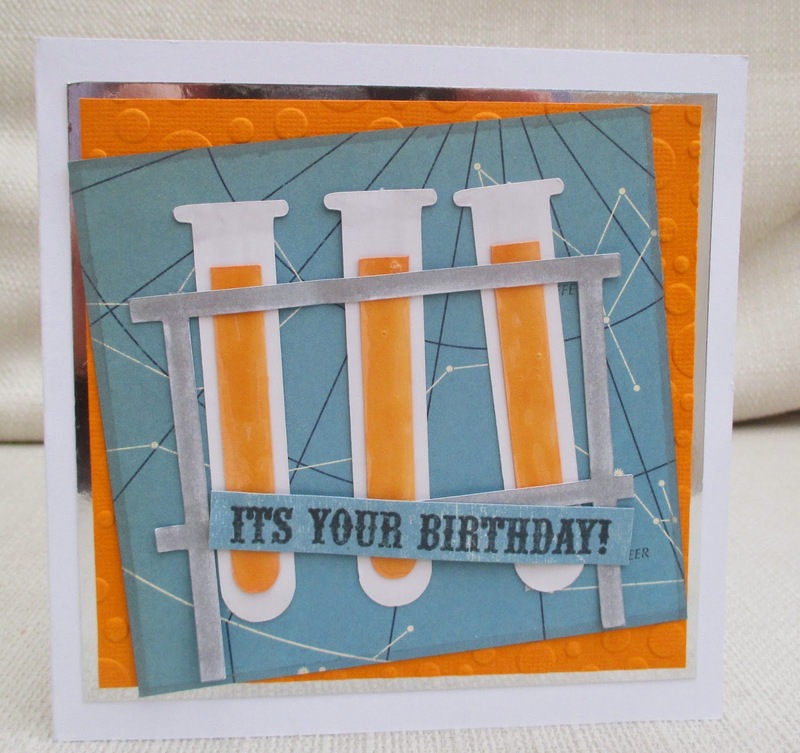 I was asked to make a card for a boy and the only information I was given was 'he likes science' . 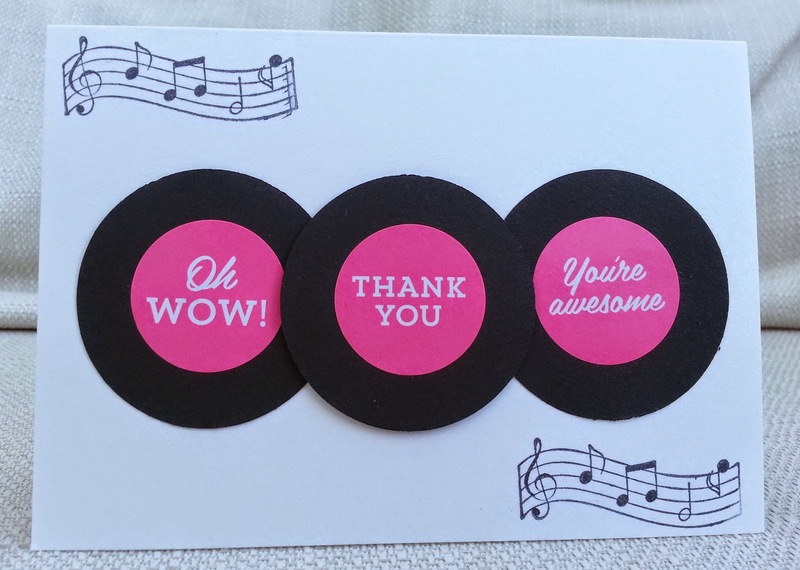 I used a cutting file from Miss Kate Cuttables (I am linking to the site because although I paid for this file, she gives away a freebie every day, which I am really grateful for). 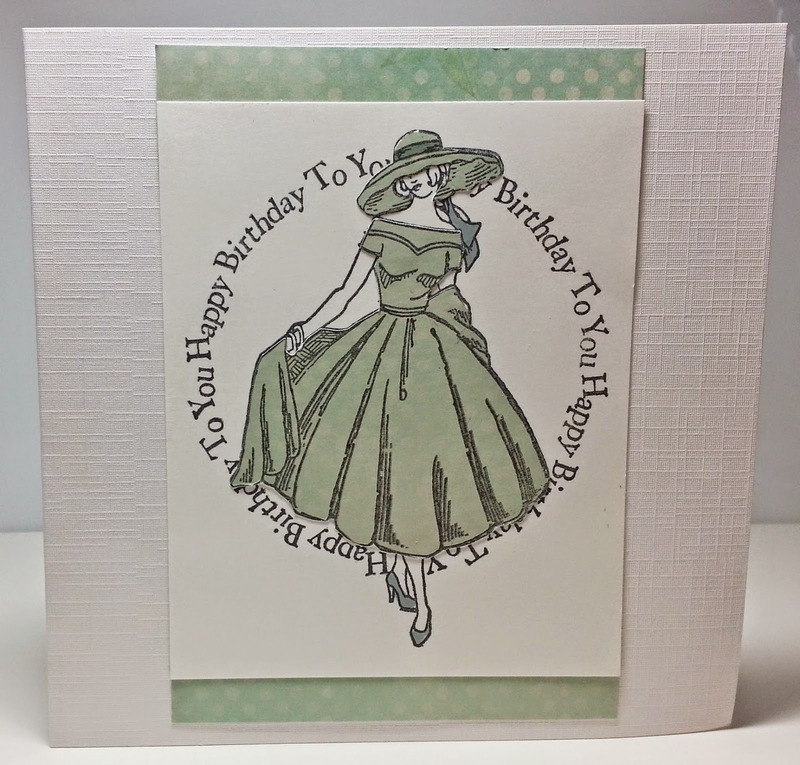 I also used a sentiment stamp, scrap of patterned paper and embossing folder. Another Christmas card. The tree was a cutting file from Silhouette but the circles were solid, so I altered the cutting file to open them up. 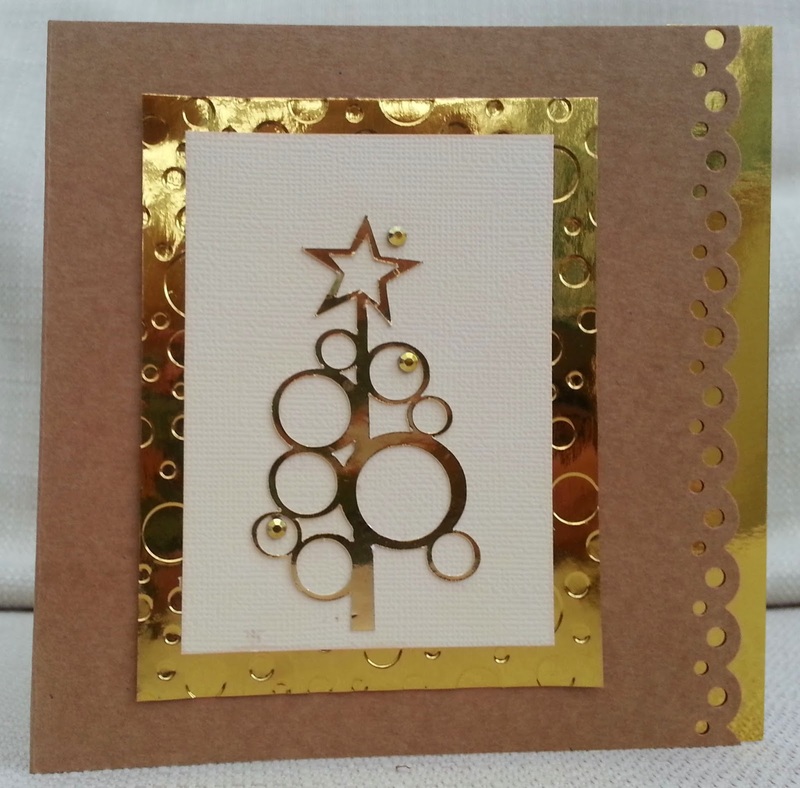 I also used a Martha Stewart border punch, circles embossing folder and some gold coloured gems. 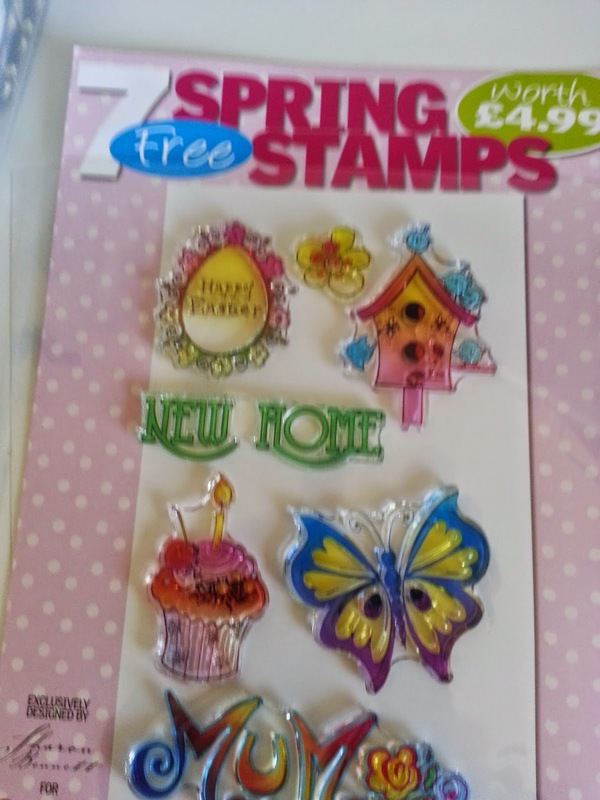 I went to the Stamperama show in Stevenage last weekend and came back a poorer woman. 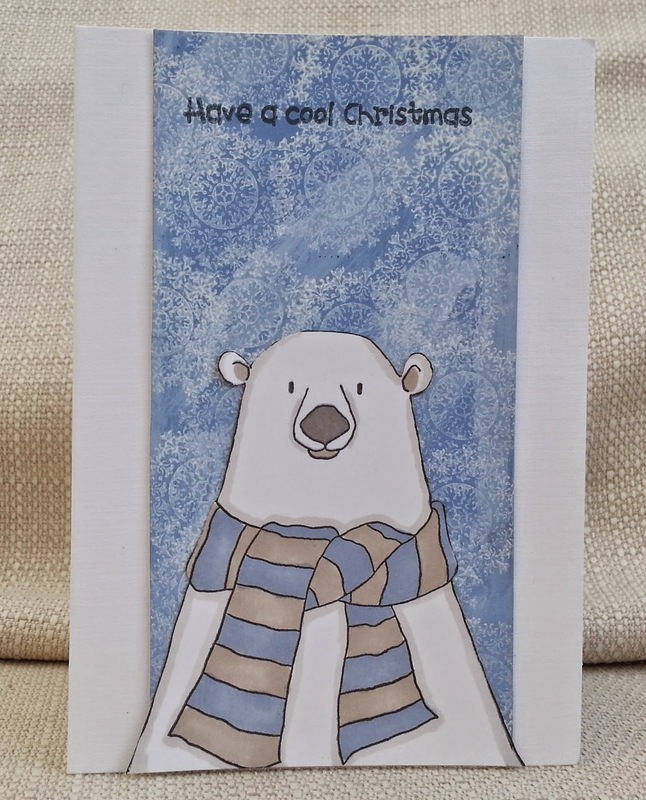 This Hobby Art polar bear was one of my purchases. I coloured him with Promarkers and cut him out. The background was made with blue and white paint and a Stampin Up snowflake stamped in white ink. The sentiment is from another stamp set , Woodware, I think. 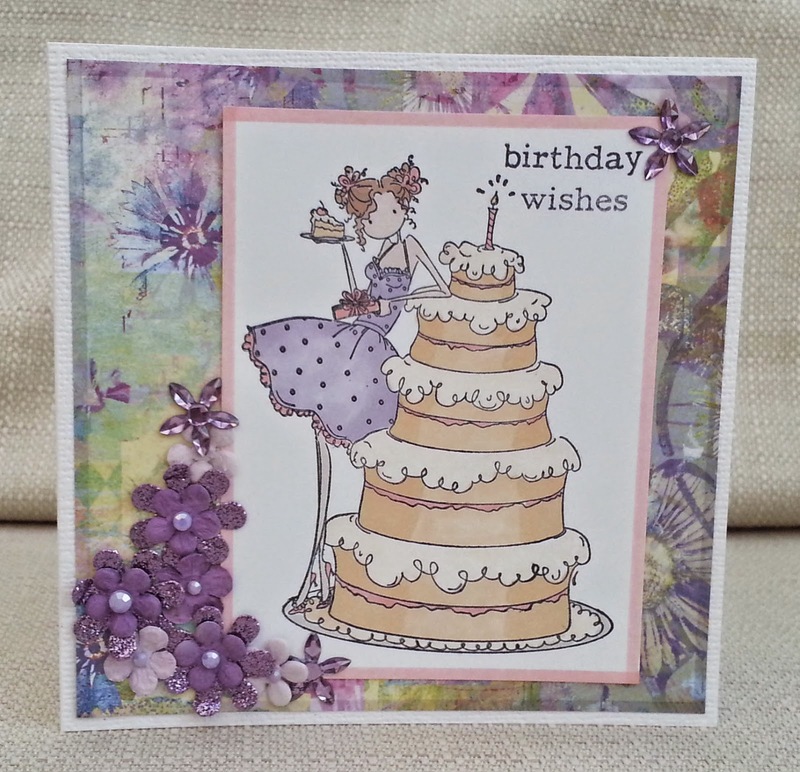 This week's challenge at Make My Monday (note our new URL) is 'Girly Birthday'. 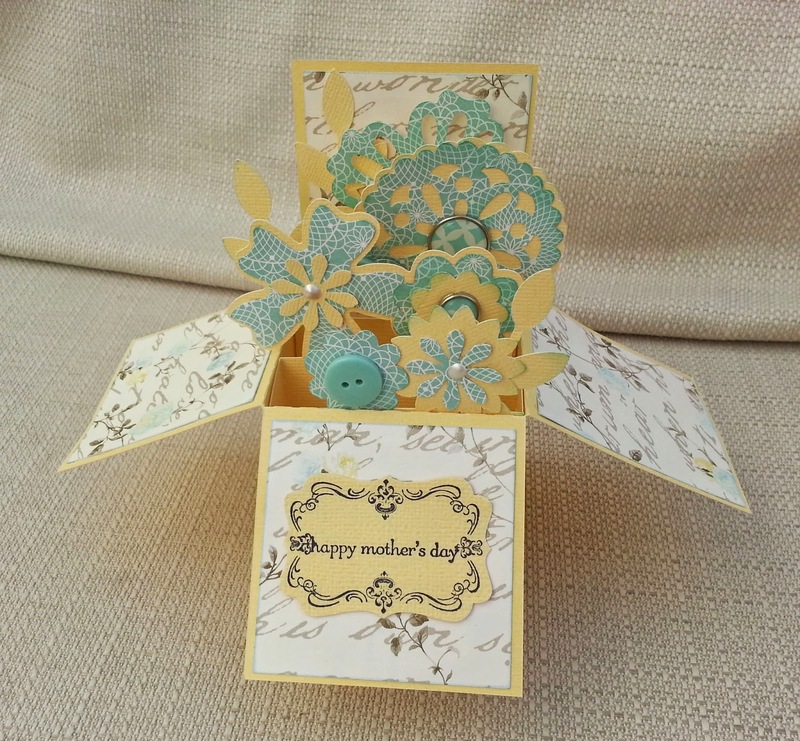 For my DT card I used a stamp by Stamping Bella that I took from my 'empty box project' box. There was no real reason I'd not used this stamp before - I like it but just not got round to it. Fot this card I coloured it with Promarkers and stamped the sentiment (Clearly Besotted) in the corner. The background paper is by Crafty Individuals and I added mulberry, glittery and sparkly flowers and gems. 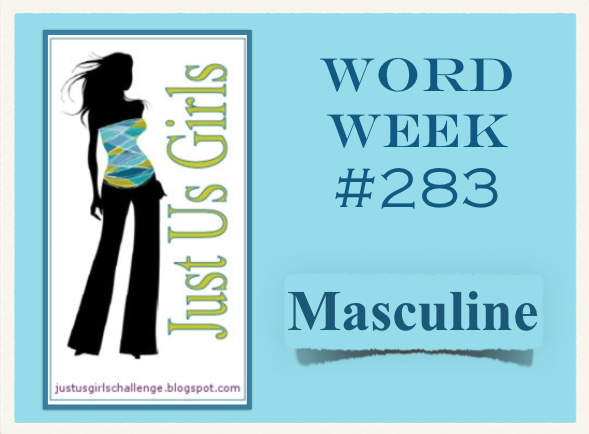 Please come over to our new web address and join our challenge at Make My Monday this week. I had this frame, which I got for £1.50 from a charity shop, and I wanted to make a picture to go in it. I was inspired by Time Out's challenge - Rock Around The Clock . The base of the picture was made digitally, using elements from two graphics sets from Lettering Delights, and the clock from a Samantha Walker digi set. 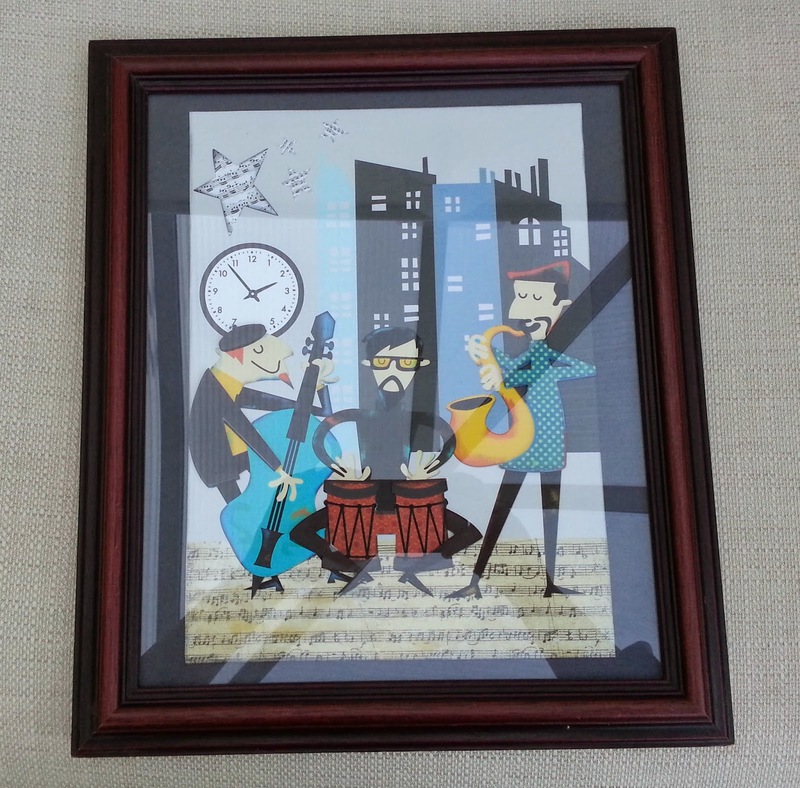 I digitally added patterns - the music paper, the pattern on the drums and on the clothes of the man on the right. Then I cut elements out using both the Silhouette and hand cutting and used 3d foam tape for dimension. A final inking and then mounted onto some plain card and into the frame.